I’m sorry to say, there is no answer to that question. Implementing Lean is hard work. It involves changing the culture of the organization and changing the organizational norms that have been built up over time and that just isn’t going to happen overnight. So I answer the question with some thoughts on how best to do it. Here’s the list for you. Go to Gemba. One of the fundamental pillars of Lean is problem solving using the scientific method. But before we can problem solve we need to fully understand the current condition. We can try to do this from a computer screen, pretending the computer sees all and knows all but a better way to grasp the situation and understand what is really happening is to get out of the office and go see for yourself. Data, reports and computers can always twist things but you can always trust the facts that you observe with your own eyes. Go to Gemba with an open mind, asking questions, particularly “Why”. Return to Gemba when you discover things you don’t know in your problem solving and get additional facts. Each time you do so, you’ll get a deeper understanding of what is really happening. Try Something. It amazes me how many people are afraid to try things. Often they are worried about trying things without having the right answer and question what would happen if they are wrong. This worry translates into a hesitancy to taking action and instead of trying things, people sit around wasting time debating endlessly. The basis of the scientific method is trying things with uncertain outcomes. We use a hypothesis to set up a test so we can easily determine if our trials worked or not. An old Chinese proverb says “The journey of a thousand miles begins with the first step”. Start and you’ll be amazed at what happens. Share the Learning. The advantage of the scientific method is that we learn from what works and we learn from what doesn’t work. The great news is we learn both ways. The key is to share the learning with the rest of the organization. Most organizations are reluctant to do this but if we only share what did work we limit the learning of the rest of the organization and someone else is bound to try again and suffer the same fate. 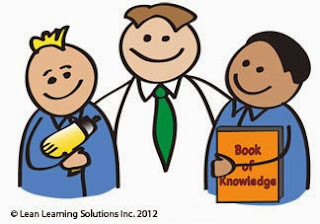 Sharing leads to lifelong learning and growing body of intellectual wealth in the organization. Three pieces of advice. All sound easy but take hard work. There is no shortcut or easy path.